Strangely, Russell Pickering, the creator of the now defunct website pentagonresearch.com has been virtually silent about some of the most important, and in our opinion, best work that he has ever done. Ultimately his research proves evidence tampering which is a Federal crime within itself. On our first trip to Arlington in August of 2006, Russell meticulously documented video cameras in the area at the Sheraton, Double Tree, Navy Annex, Pentagon, and most notably the CITGO station. A complete report of his very thorough analysis is available here. "The manager described this one as having had a clear view of the Pentagon wall and quite a bit north as well. You can see where the impact was and the higher angle of the camera that may have captured it." "You can see here on the south canopy that they have two cameras. So now on the north they have only one? The two most critical cameras in proximity to the flight path and the impact are denied by the FBI and mysteriously missing?" "Note that they use the word "impact" as a word game to comply with the verbiage of the original FOIA. They don't say whether or not the film showed an aircraft!" Now realize...when Russell published this information on September 5th 2006, the CITGO video had not been released and it was also the first day that Aldo of CIT had posted about our initial contact with Robert Turcios confirming the statement by his manager Barbara that he had seen the plane on the north side. 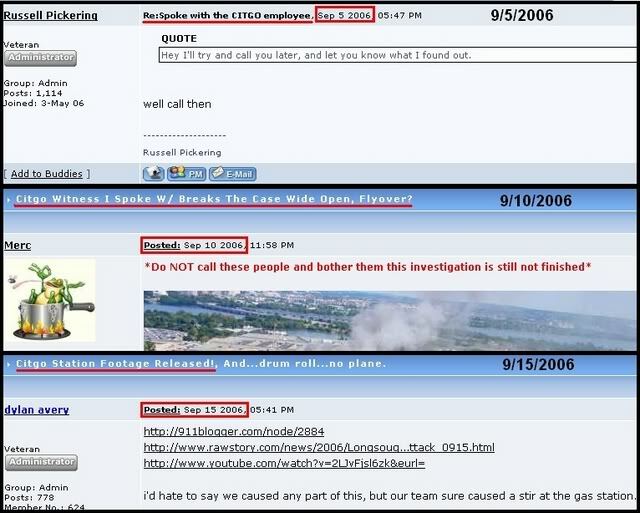 The government conveniently and suspiciously released the CITGO video a mere 10 days later on September 15th, 2006! The release of this data poses SERIOUS problems for the official story in light of the research that Russell had just reported. Because THEY MANIPULATED THE DATA TO REMOVE THE VIEW OF THE CAMERAS THAT HAD A VIEW OF THE PENTAGON THAT RUSSELL HAD JUST PROVEN WERE REMOVED AFTER THE ATTACK! The camera views indicated in red are conveniently NOT included in the data. This in essence proves that the data was manipulated to remove these critical views. This is particularly egregious since, as Russell also pointed out, their excuse to not release the other 80 or so videos is because they do not show the "impact". 1. Why did they all of the sudden choose to release the CITGO video (with zero notice or media coverage unlike the other releases) after having deliberately removed the view of the Pentagon even though not having a view of the "impact" was their excuse to not release all the videos in the first place? 2. Why hasn't Russell made a HUGE deal over the fact that he has proven evidence tampering which is a federal crime? Obviously he would have understood this incredibly important fact because of the research he had just posted about just 10 days prior. In light of the north side testimony filmed on location from Lagasse, Brooks, and Turcios obtained by CIT 2 months later the answer to both of these questions is crystal clear. The release of the proven manipulated video data was done to discredit Robert Turcios since he is not visible in the video. Russell remained silent about the serious implications of his own research because he also planned to use this government supplied manipulated data to discredit Robert and/or support the notion that the plane flew on the south side (the official story). The fact that Russell has chosen to quietly ignore information that implicates the government in a cover-up in favor of using the same government supplied information to support the official story is the most perplexing behavior I have ever witnessed from somebody who claims to fight for 9/11 truth.